The S&P 500 just posted its best January since 1997, and also had its highest measured optimism, a 6.6% risk premium, since October 2015. Whether history repeats itself is yet to be seen, but just a few days after that high risk premium, the stock market topped on Nov. 3, 2015. By December investors saw the glass as half empty, as the exuberant premium turned into a discount, and in the following period through Feb. 11, 2016, the market dropped 12.7%. Now the stock market just logged its worst week, down 3.9%, since that last drop in 2016. There are worries of rising inflation, interest rates and uncertainty over the dollar. So, perhaps it is helpful to review some of the U.S. equity market sensitivities to the rising interest rates, inflation and the dollar, but in this post the focus will be solely on the impact of the falling dollar. Since the U.S. Dollar peaked on Dec. 20, 2016, it has fallen 13.8% while the S&P 500 (TR) gained 24.3%. While the relationship is opposite overall, when correlation is measured on a daily basis the correlation is nearly zero at 0.16. 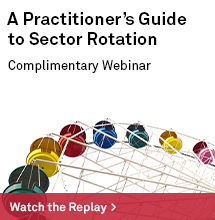 This is not surprising since many other factors may drive the stock market on any given day. However, when looking further back since 1988, there is positive correlation between the U.S. dollar and the S&P 500 (TR) until the Aug. 2000 stock market top (using monthly data) and then negative correlation since the Sep. 2002 bottom. 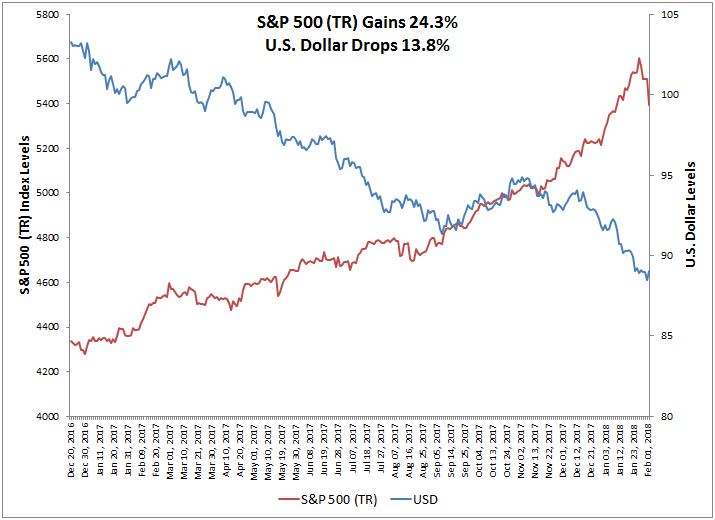 In the earlier period, the U.S. dollar and S&P 500 (TR) gained a respective 27% and 486%, and in the latter period the U.S. dollar fell -17% while the S&P 500 (TR) gained 246%. The correlation since the global financial crisis has been consistently negative though with the U.S. dollar’s strength from 2014, the correlation rose to be less negative. What changed? Many things may have changed but the decline from the tech bubble burst certainly changed the makeup of that sector. Before the decline in 2000, the information technology sector held the biggest weight at 33% of the S&P 500, but with the stock market drop, fell almost 2/3 to just 13%, dropping in size behind financials, health care and consumer discretionary. Today, the sector is the biggest again comprising 24% of the S&P 500. While the market cap weight is proportionally not as large as it used to be, the foreign revenue exposure is much bigger. The increased globalization led to more international revenue that is reflected in the S&P 500 Foreign Revenue Exposure Index where the information technology sector is the biggest by far, making up 41% of foreign revenue in the S&P 500. This may be driving much of the opposite relationship between the S&P 500 and the U.S. dollar in at least the last decade. 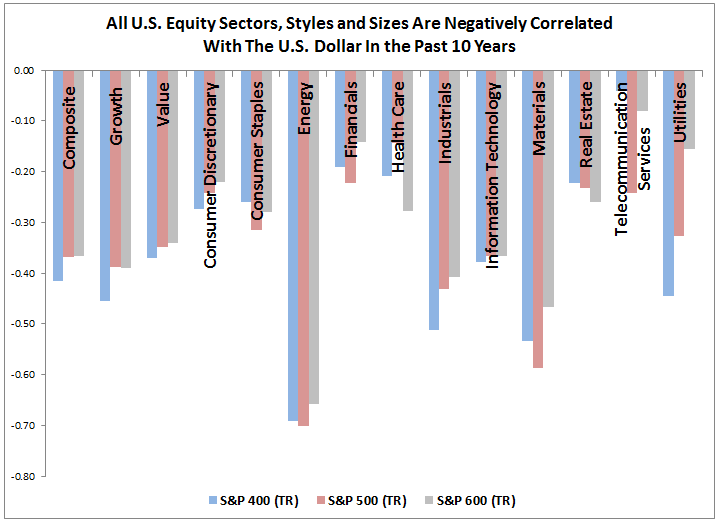 While all sectors across styles and sizes are negatively correlated with the U.S. dollar, most are only moderately negatively correlated. Though of course energy and materials are much more negatively correlated since the commodity prices underlying the businesses in their sectors are priced in U.S. dollars. Interestingly, the heavy weight of 40% information technology in the S&P 500 Growth (TR) makes it slightly more negatively correlated to the U.S. dollar than the S&P 500 Value (TR) that has energy as its second biggest sector, weighted at 12%. Though correlation matters, especially for diversification purposes, the sensitivity of the U.S. equities to the U.S. dollar is meaningful too. 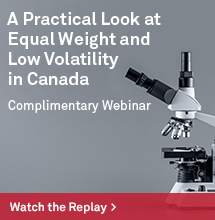 In particular, only energy and materials have negative beta less than -1 despite size, meaning it has more volatility and in the opposite direction of the U.S. dollar. 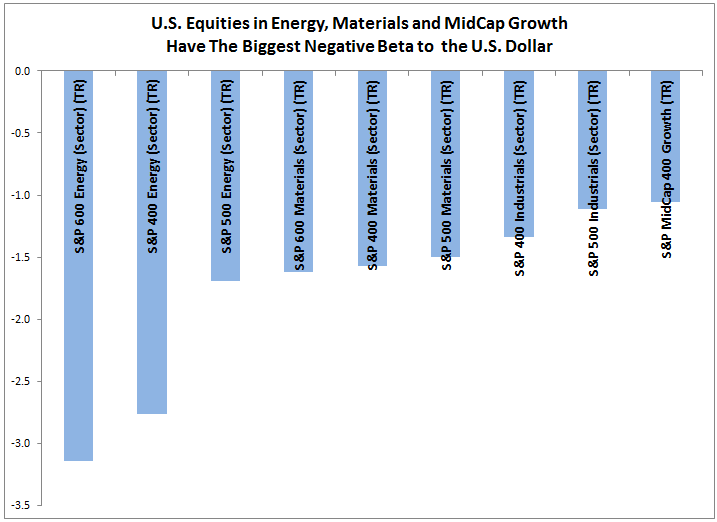 The small-cap energy sector has the biggest magnitude of negative beta of -3.14, meaning if the U.S. dollar were to fall by 10%, then small-cap energy stocks may be expected to rise 31% from that drop. That is more than the -2.76 and -1.69 respective beta measures from energy mid-cap and large-cap. Though large-caps may do more international business than the smaller companies, the smaller companies may have fewer resources to hedge against oil price volatility, leaving them more susceptible to the U.S. dollar moves. Similarly the small-cap materials sector with a 1.62 beta to the U.S. dollar is slightly more sensitive than its mid and large size sector counterparts that have respective beta of 1.57 and 1.50. 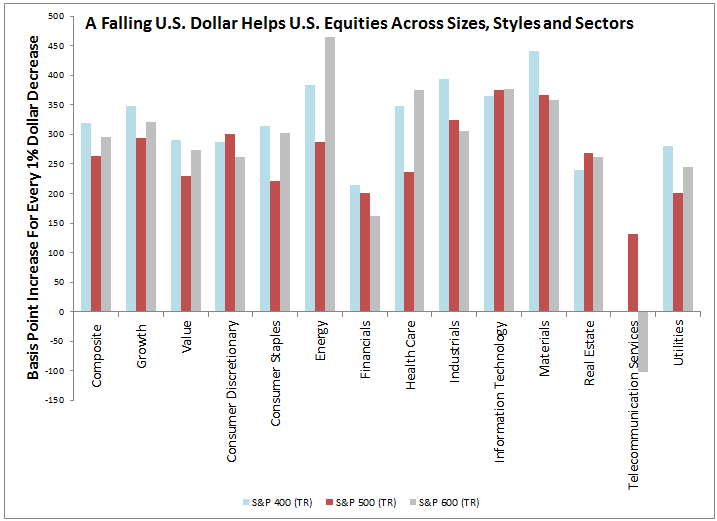 Lastly, the falling U.S. dollar helps U.S. equities but mid-caps benefit most. For every 1% drop in the U.S. dollar, the S&P MidCap 400 (TR) rises 3.20% on average. This is more than the 2.63% on average from the S&P 500 (TR) and 2.96% from the S&P SmallCap 600 (TR). The major exception to this, happens in energy where a falling dollar helps more than a rising dollar hurts, boosting the less hedged small-cap energy sector by 4.64% on average for every 1% dollar drop. The mid-caps are well positioned to grow international revenues with a falling dollar if they are on the cusp of expanding globally and need a catalyst. 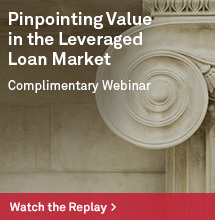 While the large caps can benefit from the falling dollar, it is likely the mid-caps can capture more new business with the global growth opportunity. Mid-caps are also positioned generally better than small-caps for international business due to their greater size and resources. 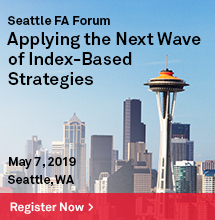 Knowing which sectors are exposed to which countries can help determine how to benefit most from the falling U.S. dollar. Also, the distinct market cap split that the S&P 400, 500 and 600 offer is important for intentionally getting exposures and improving risk management as macro economic factors move.